In our review, we hailed the Samsung Galaxy Note9 as one of the flagships to beat right now. The latest challenger to its throne is from Huawei, the Mate 20 Pro. From the looks of it, the Huawei Mate 20 Pro nearly has every tool that can either match or beat the might Galaxy Note9. We are here to confirm if our assumption is correct. Let's see if Galaxy Note9 can retain its crown as the best Android device in the world right now or if we will have a new king. From what I saw and tried, both the Mate 20 Pro and Galaxy Note9 screams premium in the build quality department. Both have a sleek metal and glass design with scratch resistance and IP68 resistance from water and dust. The Mate 20 Pro has the curvier and more compact body despite having almost the same screen size. The Mate 20 Pro has a 6.39-inch screen while the Note9 goes with a 6.4-inch panel. 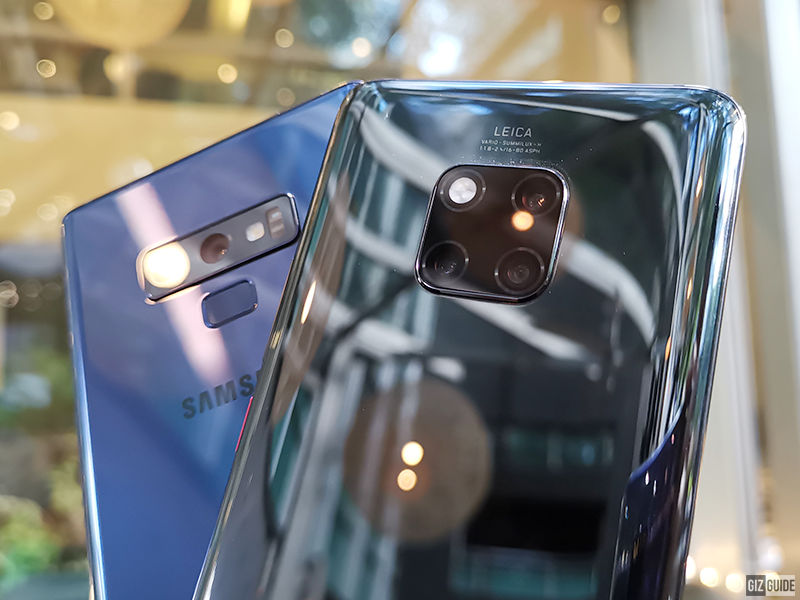 The Mate 20 Pro and Note9 measures at 157.8 x 72.3 mm and 16.9 x 76.4 mm, respectively. As you can see, the Mate 20 Pro is also the slimmer phone at 8.6 mm versus the 8.8 mm of the Note9 despite being the handset with bigger 4,200mAh battery. Both phones have a protruding cameras and they are identical in that regard. The Mate 20 Pro has the slimmer looking bezels with 19:5:9 screen aspect ratio. As expected, it goes with the notch. 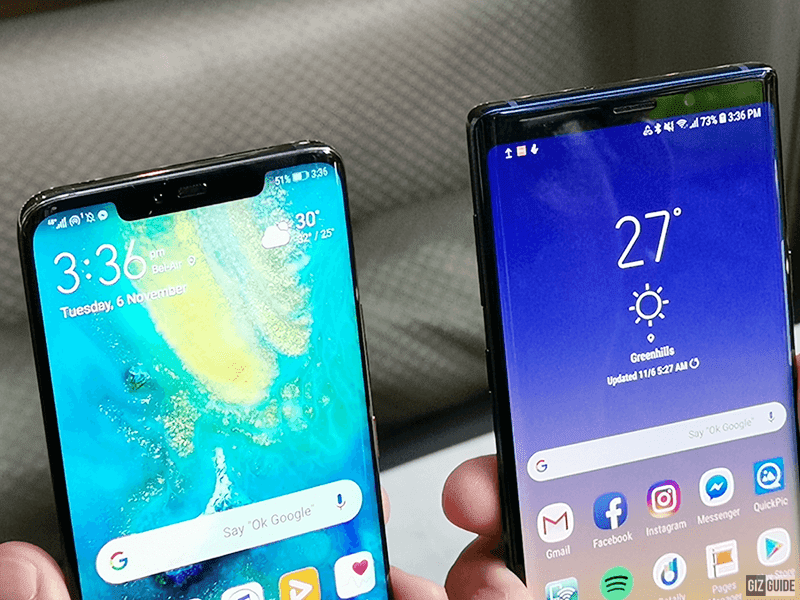 The Note9 has the thicker bezels and 18:5:9 ratio, but it doesn't have a notch. Note: You can always turn off the notch on the Mate 20 if you do not like it. Both has familiar button and ports placement. But, they are different. 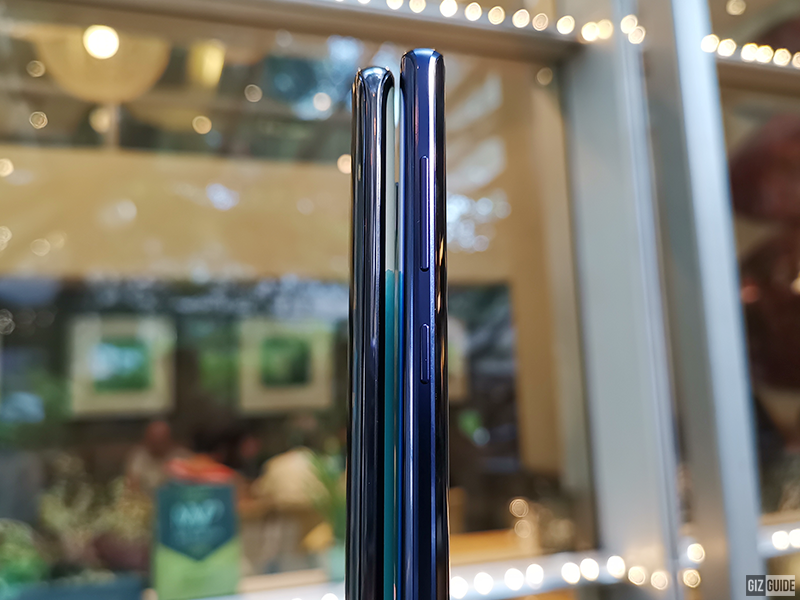 The Note9 has the volume and Bixby keys at left while the Mate 20 Pro has nothing on that side. It has both the power button and volume rocker at right. Both also goes with a USB Type-C port at the bottom. 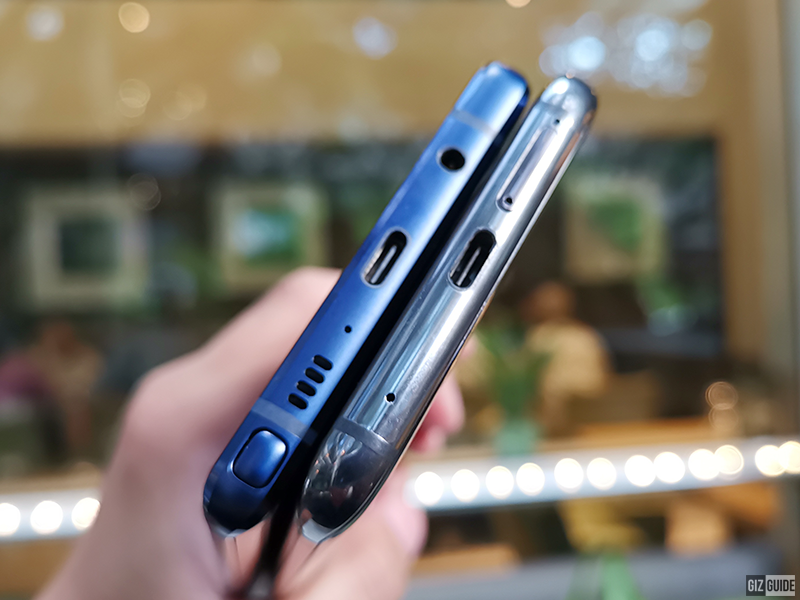 The main speaker of the Mate 20 Pro is hidden on the USB Type-C port while the Note9 has it beside the Type-C port. The Mate and Note goes with a secondary speaker found on the earpiece part to produce stereo sound with wider soundstage. The Mate 20 Pro doesn't have a 3.5 mm jack anymore. On the other hand, the Note9 doesn't have an IR Blaster. 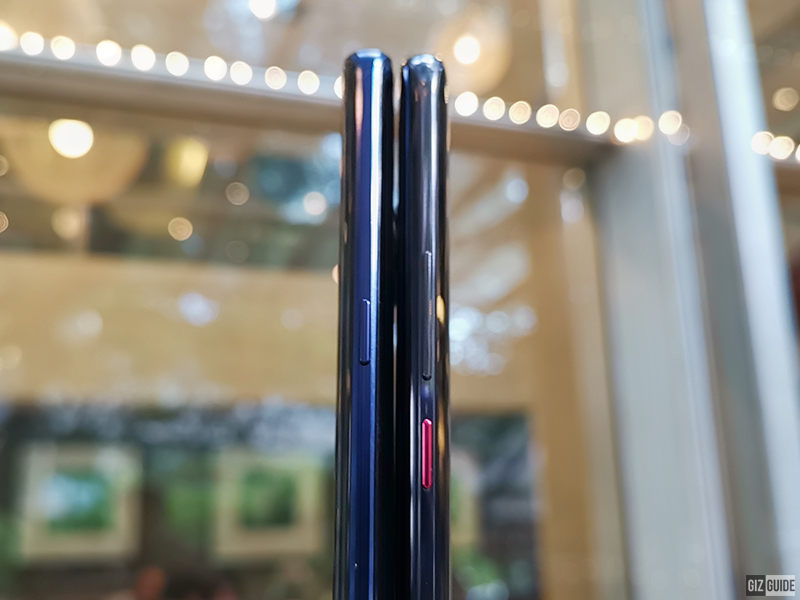 The Mate 20 Pro and Note9 weighs at 189 and 201 grams, respectively. 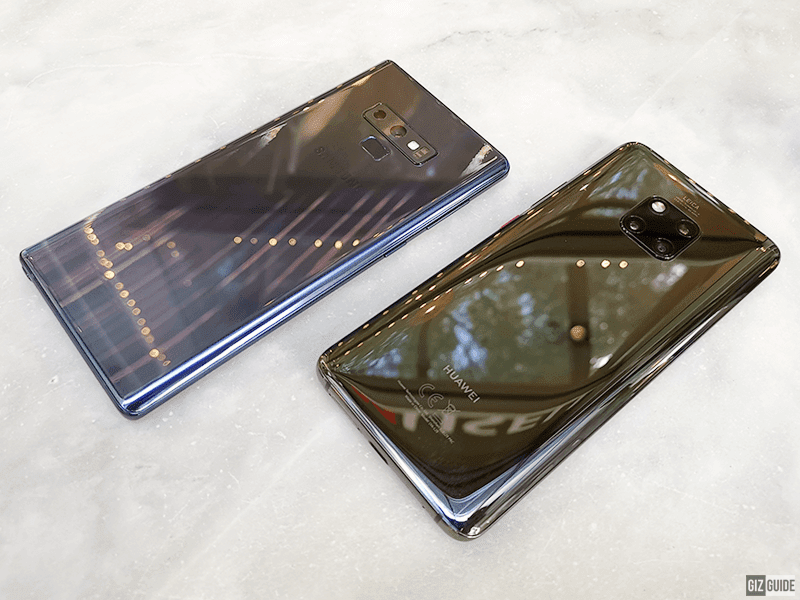 But, I would personally pick the Mate 20 Pro as it is more compact and handier than the Note9. 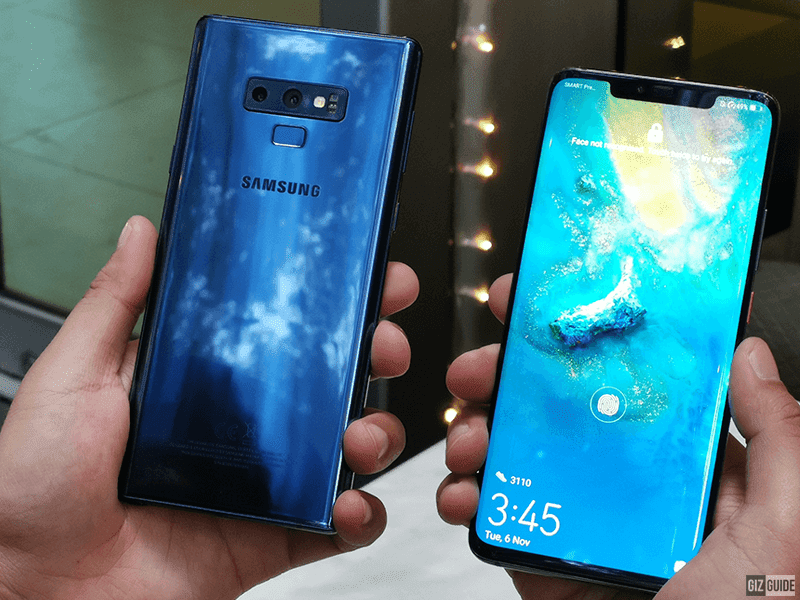 Both the Mate 20 Pro and Galaxy Note9 arrived with AMOLED screens. They are just different in size and resolution. The Mate 20 Pro goes with a 6.39-inch 3D OLED panel with 3140 x 1440 resolution at 541 ppi. On paper, it is noticeably sharper than Note9's 6.4-inch Infinity Display with WQHD+ 2960 x 1440 resolution at 514 ppi. But, in real life the difference in overall quality is minimal. Samsung's signature color tone has more saturation than the Mate 20 Pro. Some may argue that the Mate 20 has the more color accurate display. Both have deep blacks, nice contrast, and outstanding viewing angles. 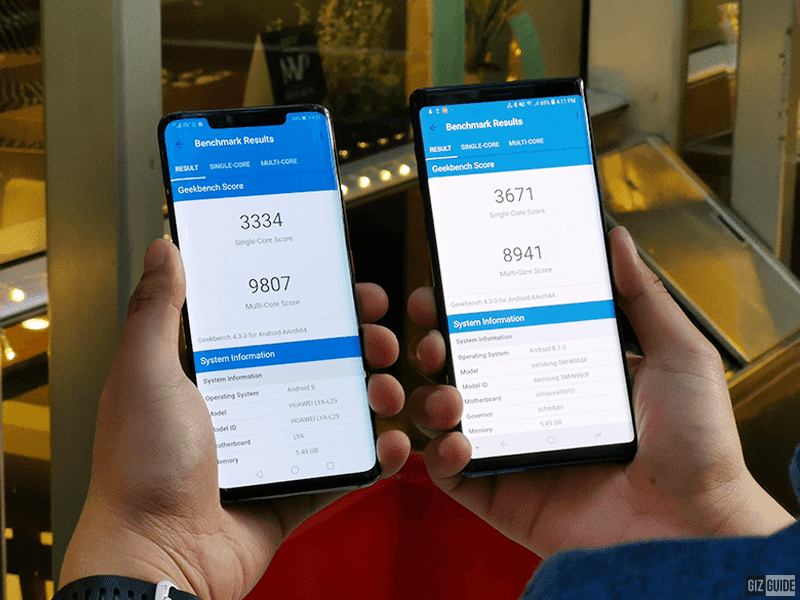 The Mate 20 Pro has the max 820 nits of brightness while the Note9 has 720 nits. The color tone of both screens can be adjusted in the display settings. They also have the eye protection feature to lessen blue light in low light. Both also have 10 points of touch for easy typing and swiping. In a good way, it is weird to see Huawei compete quite well with Samsung on the screen part. The Mate 20 Pro and the Note9 have a dual speaker setup. Both can produce loud tunes with crisp details. Huawei did a cool job with hiding the primary bottom speaker on the USB Type-C port of the Mate 20 Pro as well. However, we just noticed that the Note9 is still ahead in terms of overall speaker quality. Why? The sound it produced is fuller, clearer, and louder. For headphones, both can play up to 384K/32-bit lossless audio. 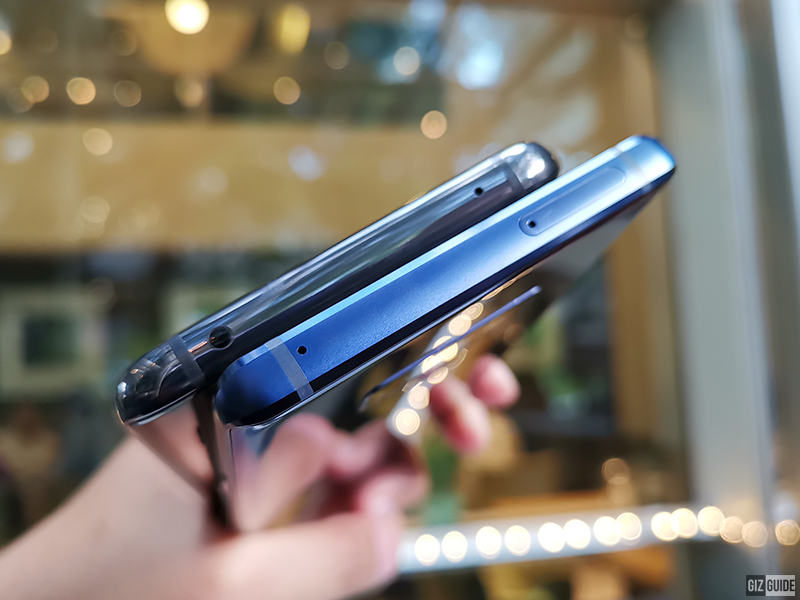 The Mate 20 Pro doesn't have a headphone jack slot anymore so you will need to use the provided dongle in the package first. The Note9 can produce the louder and clearer tunes! Anyway, both can drive most audiophile-grade earphones and some portable headphones decently. The output of the Mate 20 Pro is warmer than the P20 Pro last year. Though the output is noticeably weaker. The audio coming from the Note9 is clearer as well. It is more defined with larger soundstage. Both have Dolby audio software to tune the output. Both also arrived with Bluetooth 5.0 tech for a more stable wireless audio experience. Though as usual, wired audio will still sound better than wireless. For calls, both did an outstanding job. The ear speaker is clear and crisp. The microphones for voice are also clear on both devices. But for me, the voice I recorded using the Mate 20 Pro is better. 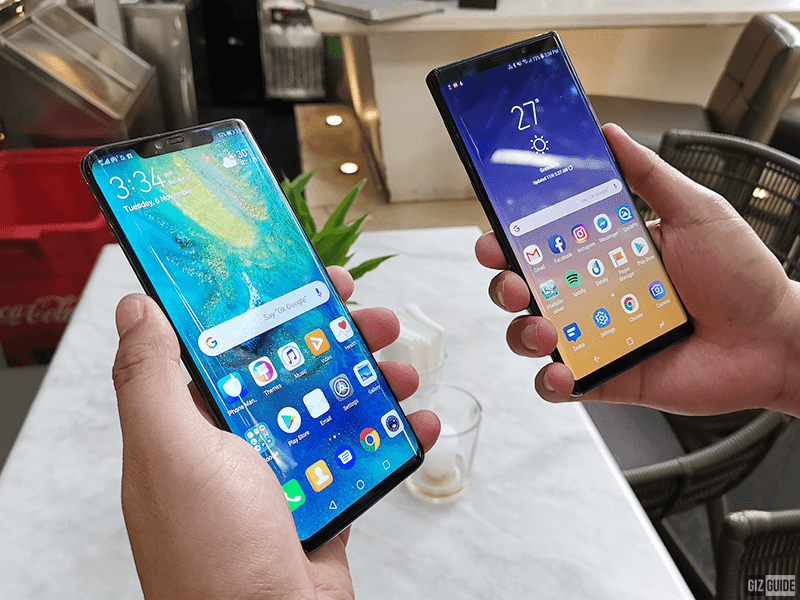 The Mate 20 Pro and Note9 are two flagships with HUGE battery capacity. The Mate 20 Pro arrived with 4,200mAh of juice while the Galaxy Note9 boasts 4,000mAh of battery capacity. At PCMark, Huawei got the higher 14 hours and 16 minutes of work battery life score versus the 11 hours and 21 minutes from the Samsung flagship phablet. The Mate 20 Pro can last for around 15 to 17 hours a day on a single charge while the Note9 can go for up to 14 hours. The screen time we got from the Mate 20 Pro under heavy usage is 5 hours and 35 minutes. On the Note9, it clocked 4 hours and 55 minutes. 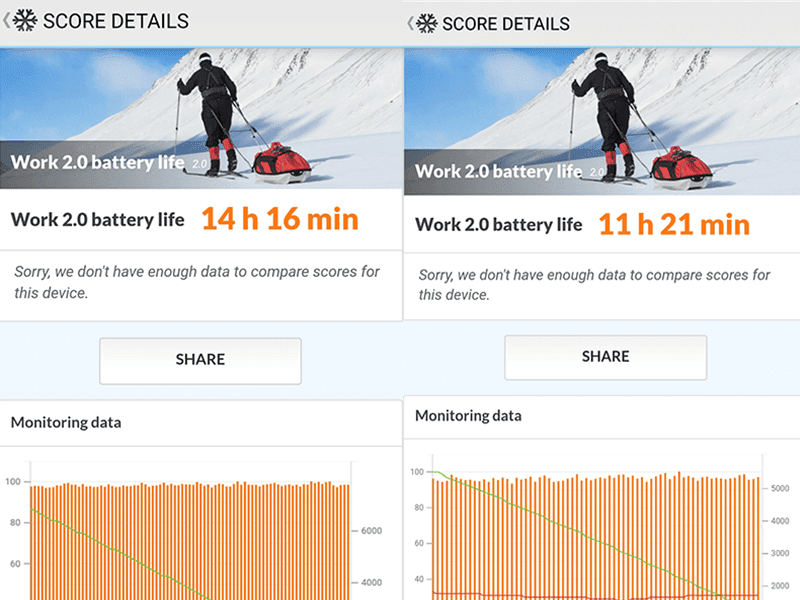 Even if both have 2K+ screens, the battery performance of the Mate is better due to its extra 200mAh of juice. In addition, it has a more power-efficient 7nm processor than the older 10nm processor of Samsung. Both phones have power saving options. 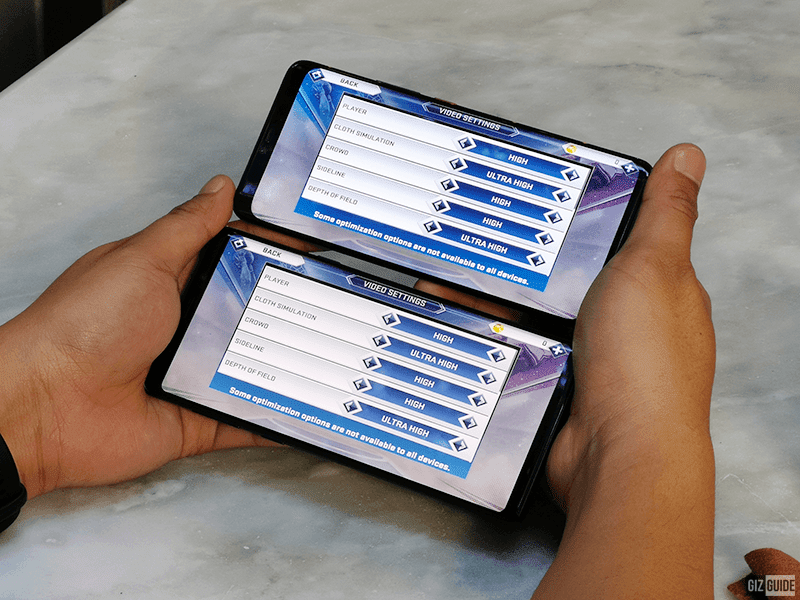 You can choose Performance mode, Power saving mode, and Ultra power saving mode for the Mate 20 Pro. It even has an option where you can apply a darker color scheme to save power further. Moreover, it has the Smart resolution feature where it will automatically lower the screen resolution to help save power when needed. For the Note9, you get the mid and max power saving options. It also has an adaptive display feature, but it is for adjusting the color of the display and sharpness. You can just adjust the screen resolution to save power manually. In terms of charging speed and other technologies, the Mate 20 Pro is also ahead for me. It has the 10V/4A 40W SuperCharge technology that can charge the phone up to 70 percent in 30 minutes. In our test, we were able to fully charge the phone from 0 to 100 percent in 1 hours and 10 minutes. That is insanely fast for a phone with over 4,000mAh battery. For Note9, the adaptive charger of Samsung can charge the unit from 0 to 100 percent in over 90 minutes or around 1 hour and 30+ minutes. Not bad, but not as fast as the Mate 20 Pro. Both also have wireless charging. The Mate 20 Pro has 15W support which can charge the phone from 0 to 100 percent in under 2 hours. On the other hand, the Note9 is a bit slower at around 2 hours and 30 minutes. The Mate 20 Pro also has a feature that the Note9 and any other phone in the market doesn't have yet, the reverse wireless charging feature. It can let you use the Mate 20 Pro as a wireless charging pad for phones with wireless charging support like the Note9. 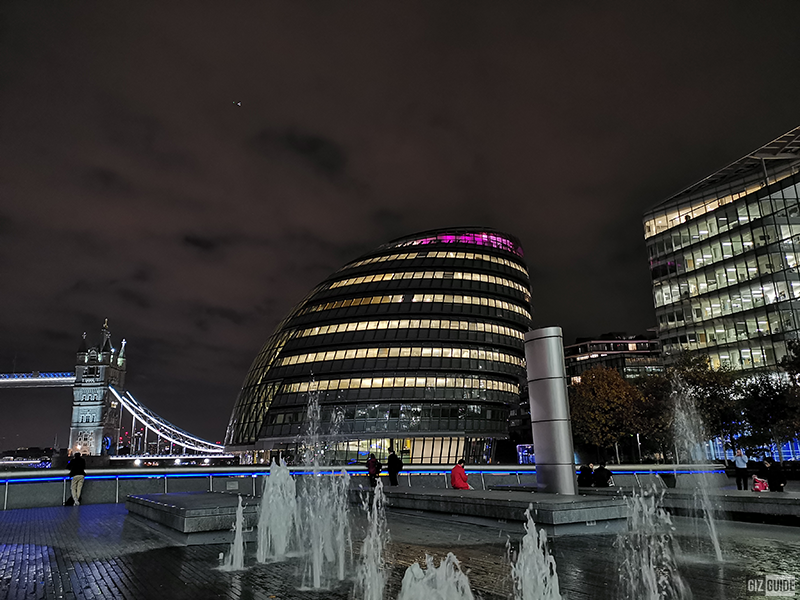 One of the primary highlight of the Mate 20 Pro is its new triple Leica camera system. It features a 40MP f/1.8 RGB sensor with massive 1/1.73-inch size, 20MP f/2.2 ultra wide-angle, and an 8MP f/2.4 OIS telephoto sensor. Huawei replaced the monochrome sensor with an ultra wide-angle lens. It also have 4D predictive focus, AIS, 5x zoom, and dual-tone LED flash. It also have most of the modes for photography coming from the P20 Pro like Super Night Mode, lighting painting, and robust pro mode. My favorite new feature is the ultra-wide angle lens. It can simply let you see more and be more creative with your shots. The monochrome sensor is gone, but the monochrome filter is still there. Since it is a filter tuned by Leica, the result is comparable with a dedicated monochrome lens. The Mate 20 Pro can still let you take dramatic black and white shots. The result? It is the most versatile camera setup by Huawei yet. On the other hand, the Note9 is Samsung's best camera on a phone too. The special thing about its rear dual-camera setup is the variable aperture mode. It has a 12MP (f/1.5/f/2.4) primary lens paired with 12MP f/2.4 telephoto lens. The 12MP (f/1.5/f/2.4) sensor can automatically switch from f/1.5 to f/2.4 when needed. It will use the f/1.5 brighter aperture for low light shots and it will use f/2.4 on daylight shots. It also has a Dual Pixel focus, Dual OIS for stabilization, multi-frame, and dual-tone LED flash. As expected, both devices has super fast focus and saving speed for a smartphone. We just noticed that the Mate 20 Pro can focus closer when you use the wide lens with the 2.5 cm super macro mode. In terms of picture quality both are amazing camera phones. Let's have a look at our shots. Note: Most of our shots are with Master AI (Huawei) and Scene Optimizer (Samsung) tech. 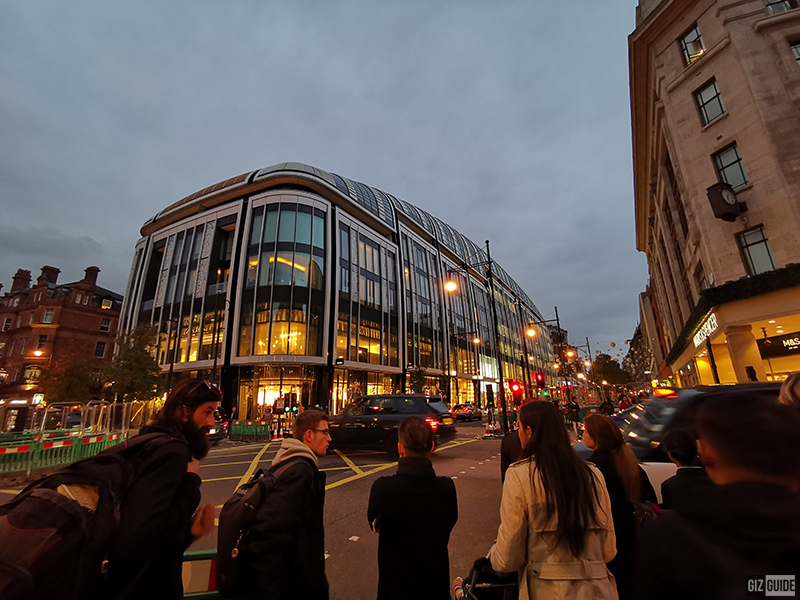 On the first shot on an against the light scene, the Mate 20 Pro got the image with sharper details, brighter exposure, and wider range. The greens on the trees are more visible on the Note9. 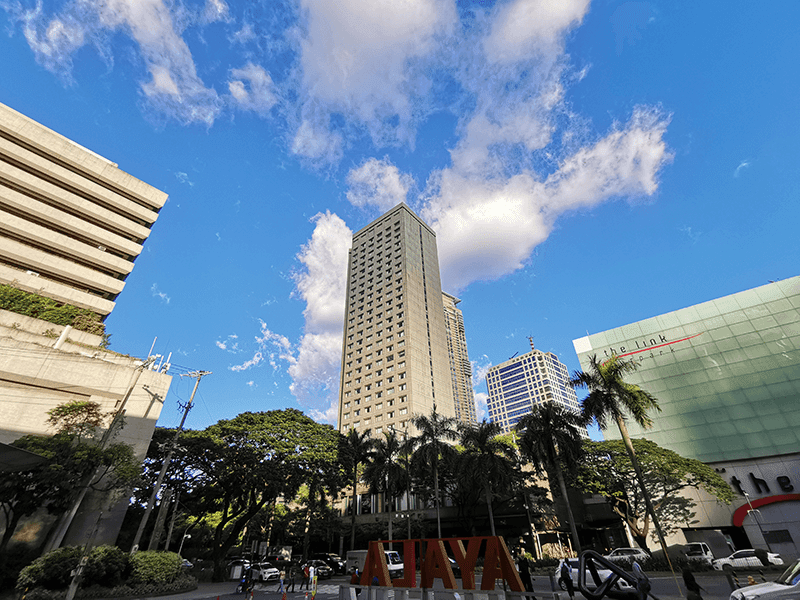 But, our subject here is the building of Shang hotel. Huawei's flagship did a better job on the subject and the clouds. On the next photo, Huawei got the image with slightly brighter exposure again. But, the colors on Note9's shot looks more natural. Contrast are deeper too. It has less grain to my eyes as well. On the food shot, Mate 20 Pro blurred background a bit better. The image it got is a bit too contrasty to my taste. The details are also softer and the colors look less natural compared with the Note9. With 3x zoom, Huawei got the image with the more pleasing result. Its colors are more accurate as well. The Note9 also has a decent 3x zoom with brighter exposure, but it is grainier Mate's 3x optical zoom. The output of the 5x zoom is identical to the 3x zoom for both devices. Again, Note's output is brighter but not necessarily better. It is a closer match here compared with the 3x zoom. It could go either way depending on your personal preference. The 10x zoom is where Huawei will fully shine. It looks close to lossless in quality. Grain is minimal, details are crisp, and blacks are deep. The 10x zoom of the Note9 is far from bad, but the zoom of the Mate is simply better. Exposure is on point on the Mate 20 Pro here. Highlights and shadows are balanced. The level of detail and bokeh is also better than the Note9. The Note9 has the brighter photo, but it is a bit overexposed here. On auto night shot, the Mate got the image with the sharper details and less noise. Note9's shot is brighter, but details are not that crisp. Huawei handled the shadows and exposure better again. 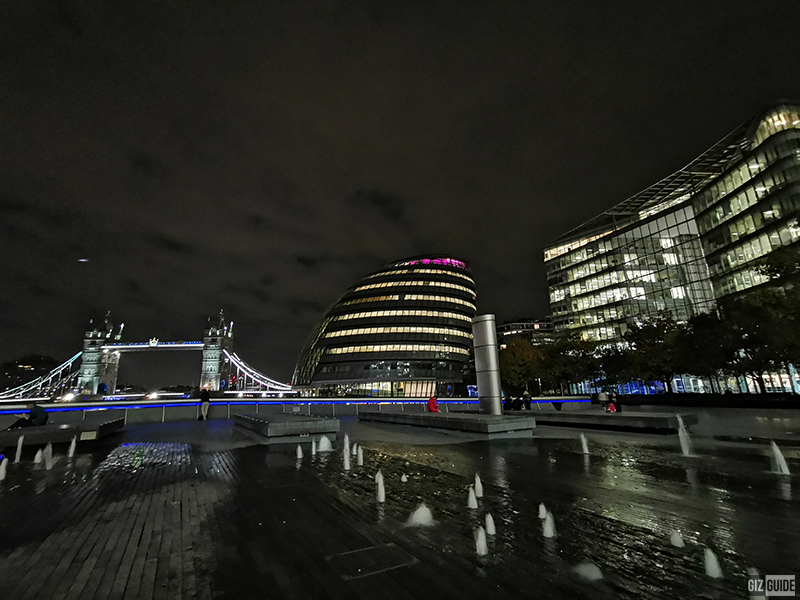 On our next night scene, details and dynamic range of the Mate 20 Pro is better again. Our Note9 shot is softer in this scene. Even on auto mode, the Mate 20 Pro can shoot good images in low light due to its large 1/1.73-inch sensor size. But, it can even make those good night shots even better. How? 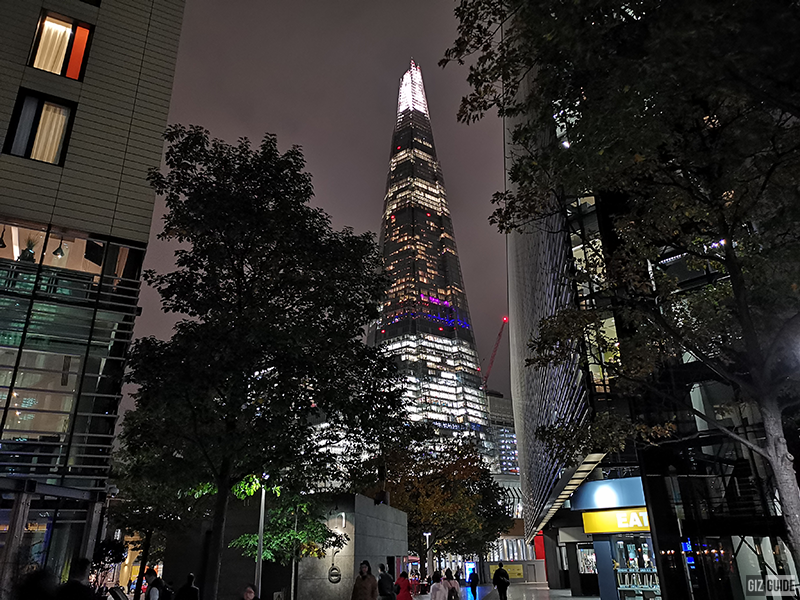 The Mate 20 Pro also has the Super Night Mode feature found on P20 Pro. It will allow you to take up to 6s handheld long exposure shots. Yes, handheld and no tripod needed. 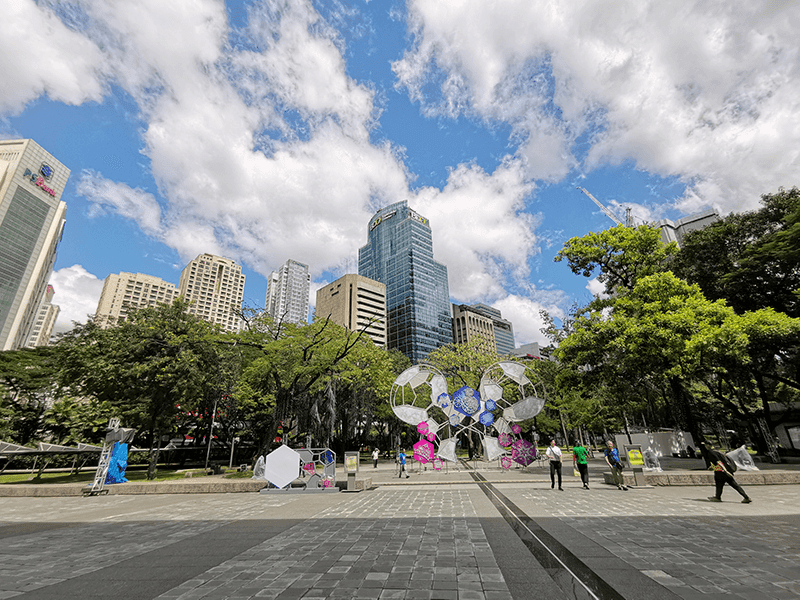 The 3rd lens of the Mate 20 Pro will also allow you to take ultra wide-angle shots. It will simply allow you to be more creative with your shots and see more. The cool part? it works even for the night mode function and other modes like the light painting mode. For selfies, Huawei got the large 24MP f/2.0 snapper with AI face beauty and 3D portrait lighting. On the other hand, the Note9 only has an 8MP sensor. But it is a lens with bright f/1.7 aperture size. Both also have cool effects like different filters and stickers. On the mate you can even pick the 3Q Qmoji feature. I just find the AR of the Note9 a bit better as it can allow you to even create an animation of yourself. The Mate made by face whiter here. Colors are a bit washed too. But, details are sharper than the Note9. Highlights aren't blown out as well. The Note9 got the image with more accurate colors and nicer contrast. But, its background is washed. On this indoor shot with same level of face beauty and depth effect, Huawei showed that its 24MP snapper can shoot images with better details and more accurate colors. The Note9 made the face of Neil whiter and definitely softer. It is a close match in the next low light scene. The Mate produced the selfie with slightly more details and brighter exposure. The dynamic range is noticeably wider too. But, my eyes looks sharper on the Note9. Again, colors are more accurate as well. For videos, the Mate 20 Pro has the ability to shoot up to 4K 30fps. It can also shoot 1080p at 30fps and 60 fps. It can also shoot up to 960fps super slow motion videos as well. The cool part? 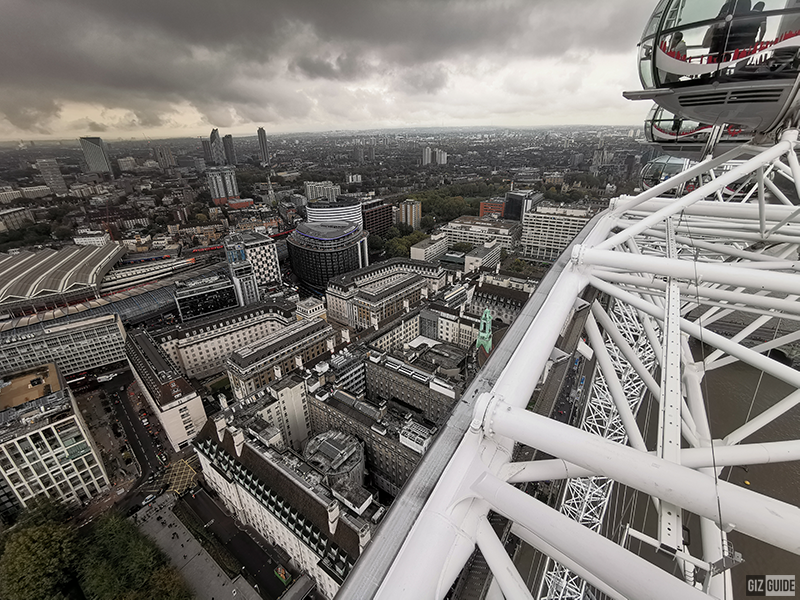 You can even take ultra wide-angle videos. It even has AI for intelligent zoom and speedy focus. It also has a lot of modes like the AI colour and bokeh for videos. For selfies, it can shoot up to 1080p videos without face beauty and 720p with face beauty. On the other hand, the Note9 is a great camera phone for videos too. It can shoot up to 3840 x 2160 UHD 60 fps with stabilization up to 4K 30fps. The Note9 also has up to 960 fps super slow motion mode. The front facing camera can shoot up to 2560 x 1440 at 30 fps but can only be stabilized up to 1080p 30 fps. It can shoot videos with sharp and clean details with vibrant colors. They are pretty even for videos. The Mate 20 Pro is the most stabilized phone of Huawei for videos yet. 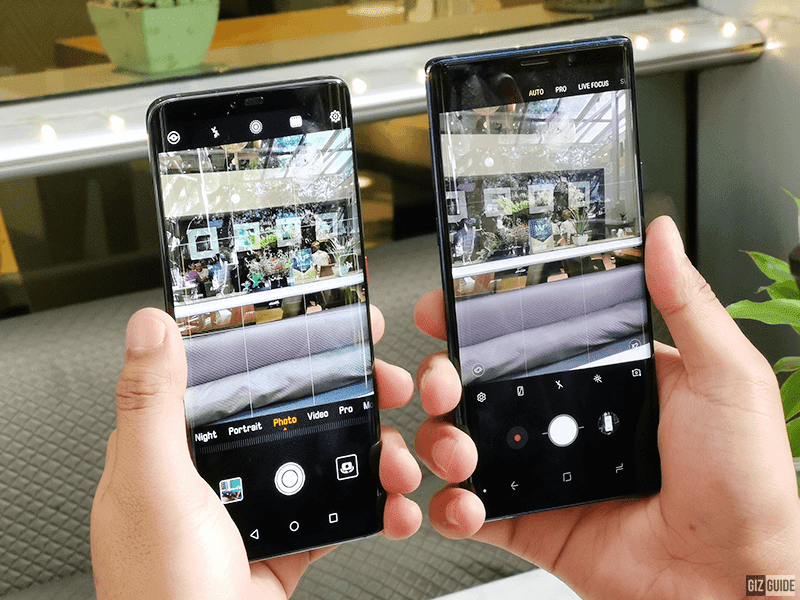 Note9's advantage is it can shoot up to up to 60 fps of 4K videos. 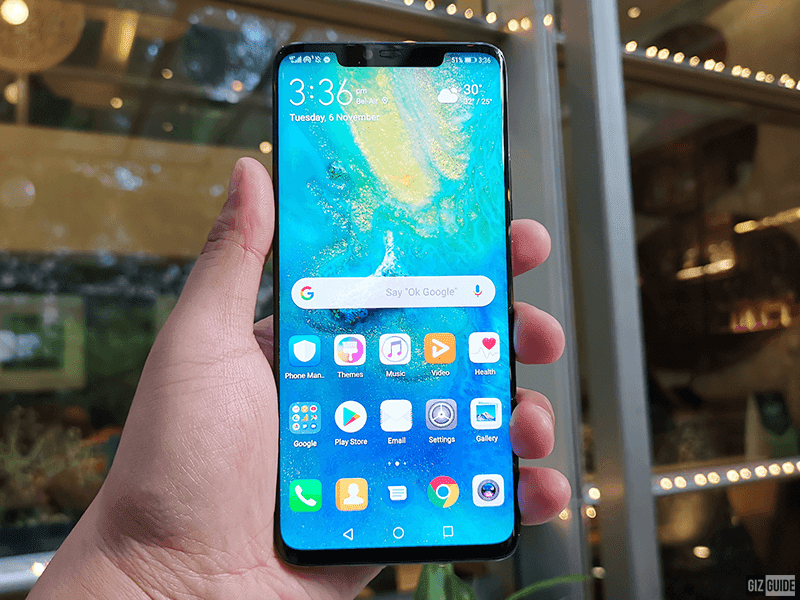 The Mate 20 Pro's advantage is it can shoot ultra wide-angle videos. The Huawei Mate 20 Pro is the first Android smartphone in the world equipped with a 7nm SoC, the Kirin 980. The Kirin 980 is a 64-bit octa-core processor with a maximum clock speed of 2.6GHz. It also goes with the new Dual-NPU to handle AI related tasks better/faster and the Mali-G76 MP10 GPU with GPU Turbo 2.0 technology. The chip is aided by 6GB LPDDR4x RAM and 128GB of storage. Huawei uses the new NM card slot to expand the storage of the Mate 20 Pro. 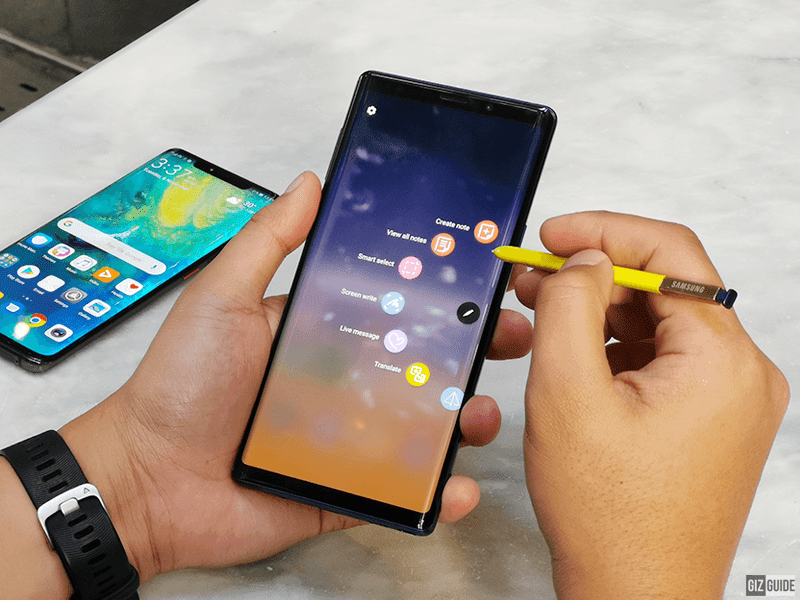 On the other hand, the Samsung Galaxy Note9 is also a capable flagship smartphone. It is the fastest Note yet. It runs with the 2.8GHz 64-bit Exynos 9810 octa-core processor paired with Mali-G72 MP18 GPU. It also goes with up to 8GB RAM and up to 256GB of expandable internal storage. Overall, the Mate 20 Pro is the speedier phone based on benchmarks. In actual usage, the Mate 20 Pro also showed that it is the smoother phone in general. It is speedier when it comes to opening apps, switching from, an app to another, and playing games. Both can play games at the highest settings. Though the Mate 20 Pro provided the smoother actual gameplay in our experience. Thermal management is about the same on both phones. They get warm, but far from hot and alarming. The Mate 20 Pro sports the newer Android 9.0 OS with EMUI 9.0 skin. It is Huawei's cleanest UI to date with lots of great functionalities. Aside from the on/off app drawer and a lot of themes, it now has gesture support settings that can be customized easily. EMUI is now more integrated to Google than ever. The Google Assistant is there and most of the Google apps are there as well. Huawei also improved the settings menu to make it look less cluttered and easier to navigate. For one handed operation, there's a one-handed mode. You will also find the Digital Balance feature which shows how long your stare at the screen of your Mate and understand your habits. You can also set a time limit there. 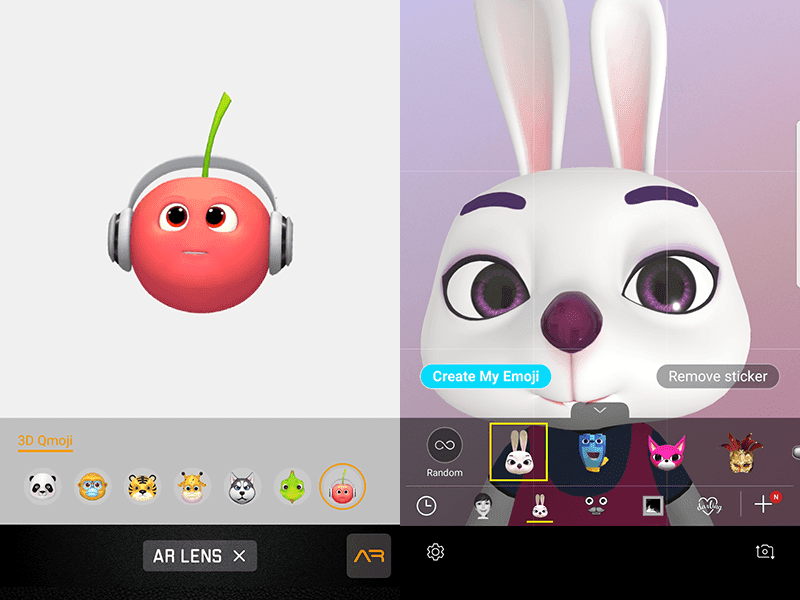 The Mate 20 Pro also has the new AI Spotlight Reel recognize people in the videos you took using your smartphone and stitch them into a one cool video clip. We also noticed that the knuckle screenshot feature is easier to use than ever. It also has the Password Vault that allows you to securely store your passwords in different accounts and let you login faster. It also has the Phone Manager which will allow you to manually optimize your phone. But, it also has the power of AI to keep your Mate fast always. It knows when you are not using an app and it will automatically turn it off. The AI also make the apps you are opening a lot faster. Lastly, has the HiVision software found on the camera app to replace Google Lens. You can use it to detect an object, check the calorie count of the food you will eat, translate language, and more. On the other hand, the Note9 loads with the older Android 8.1 OS. Though it has the new Samsung Experience 9.5 skin. In our experience, there is a huge difference between the old version 9.0 found with S9/S9+. It now supports the latest version of Bixby assistant and it added new features for the S Pen like Bluetooth. There is very little difference in appearance, but it feels and looks faster and lighter than the old Samsung Experience 9.0 in general. Bixby can now accurately recognize the world you'll speak. It can also give answers to questions, set an alarm, control Spotify, and more. You will also find the one-handed mode, finger gestures, quick launch camera, multi-window support returns. You can now easily pair more apps together when launching the multi-window mode as well. 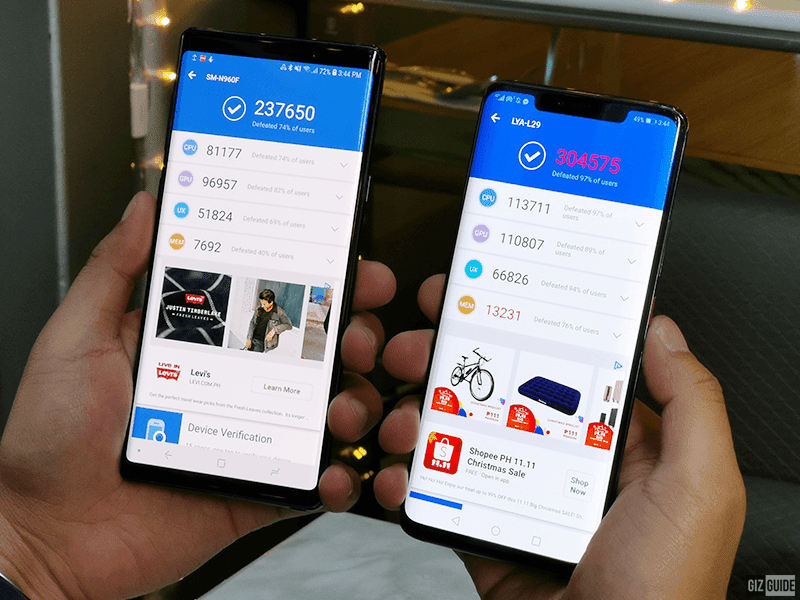 You can also use the Samsung account to store your settings and more in the cloud and retrieve them easily when you transfer to a different Samsung device. The Mate 20 Pro is one of the few with the In-Display fingerprint scanning solution. It isn't still as fast as traditional fingerprint scanners, but in our experience, it is the fastest and most accurate In-Display fingerprint scanner yet. The Mate 20 Pro also has the 3D face unlock. It is one the speediest and safest face unlock in the market right now. On the connectivity part, the Mate 20 Pro goes with extra strong connectivity options. GSM signal is strong always and it has the highest Hi1103 WiFi chip with up to 1.7Gbps download speed and 4G LTE Cat 21 with up to 1.4Gbps download speed. It also has Bluetooth 5 BLE and dual-band GPS. On the other hand, the Note9 uses has the traditional fingerprint scanner. It isn't as cool as the In-Display solution, but it is a bit more reliable and faster. The Intelligent Scan uses both the Iris Scanner and the Face recognition to unlock your Note. But, we noticed that it isn't as great as the 3D scanner of the Mate. It doesn't work that fast in low light. The S Pen is the key selling point of the Note. It now has Bluetooth as well. Aside from jotting down notes and doing smart gestures, it can now be used it as a clicker for your presentations and even selfies up to 10 feet away. On the telephony part, experience is good. WiFi, 4G LTE+, Bluetooth, GPS are all fast, responsive and stable while the calling, texting, and data are mostly reliable. Its WiFi, 4G LTE, and GPS are not on the level of the Mate though. 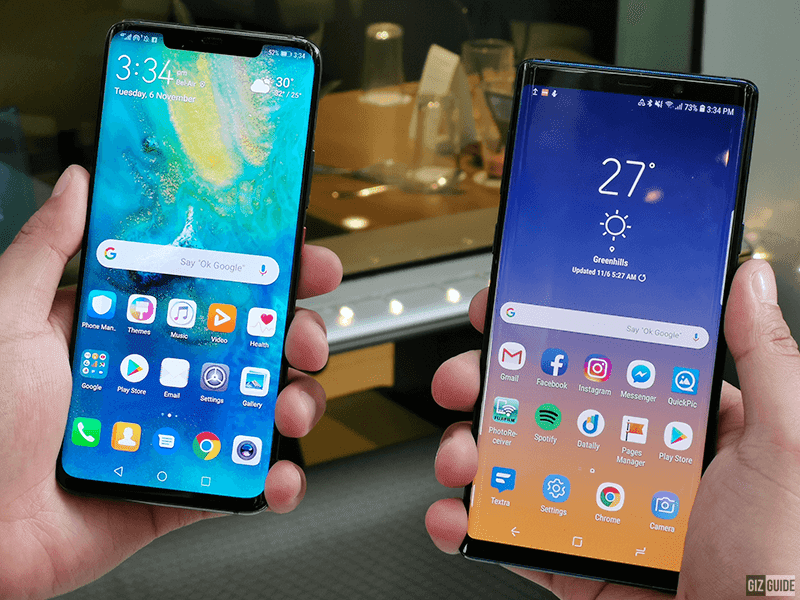 Both the Huawei Mate 20 Pro and Samsung Galaxy Note9 are amazing high-end smartphones. They both have their advantages and disadvantages over each other. 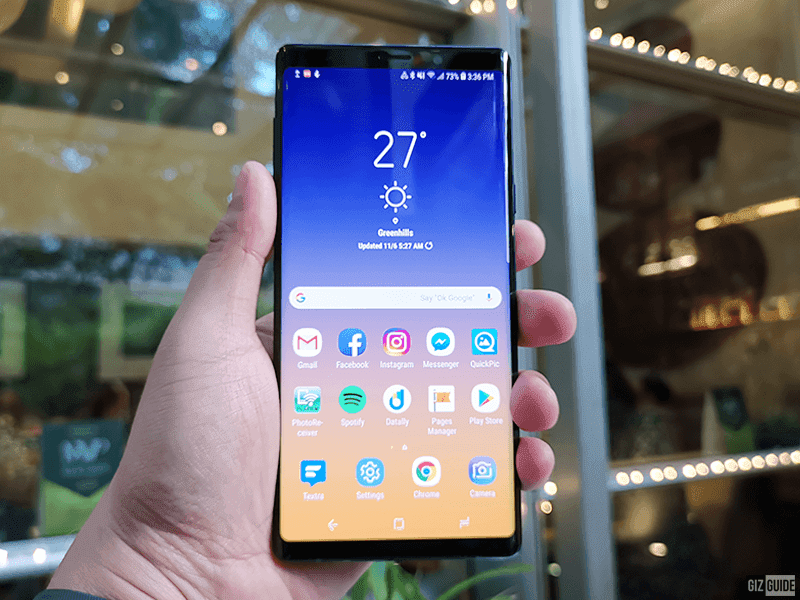 The Samsung Galaxy Note9 proved that it is a force to be reckoned with. It is a really fast device with the biggest battery capacity on flagship Samsung smartphone yet. Cameras are amazing too, stereo speakers are loud, and it has the much improved S Pen for productivity. However, it is clear in this comparison, that the Mate 20 Pro have more advantages over the Galaxy Note9. Huawei showed that their R&D muscle is harder than Samsung this time. Its new 7nm Kirin 980 processor with Dual-NPU to handle AI tasks is simply a monster. It is the speediest and most intelligent chip on all commercially available Android smartphone right now. The Mate 20 Pro have a way better battery life/charging speed, more versatile triple-Leica camera system, stronger connectivity options, and newer security features despite the more affordable price tag. It is the speedier handset with better battery, connectivity, and camera performance. For us, the Note9 is the previous boss in the world of Android phones. But, to be the man you've got to beat the man. The more affordable Mate 20 Pro bested the pricier Note9 our comparison. Therefore, the Mate 20 Pro our new King of Android this 2018. The amazing part? The Mate 20 Pro is more affordable than the Galaxy Note9.